Wow. I had no idea celery could taste this amazing. The recipe comes from my friend Lorna - it's a family recipe from her former mother-in-law, Sharzad Mohit. I think the key here is cooking the celery very, very gently. With the fresh mint and parsley it is absolutely spectacular! It should be served with saffron rice. In a large stew pot, fry onions until golden brown. Remove the onions from pan and sear the meat. Add water and onion to the pot and simmer until meat is tender (this depends entirely on the cut of meat you use). In a large pan, gently fry celery in oil, 20-30 minutes. Do not crowd the celery or let it brown, and do not let it shrivel much. During the last 10 minutes of cooking add paprika and turmeric. It should be soft, as if it had been steamed. Add celery, herbs, garlic and lemon juice to the pot and cook about 5 minutes more, on moderate heat (light simmer, no boiling). Add salt and pepper to taste. Steep the saffron the boiling water. In a skillet that can be tightly covered, melt the butter over medium heat. Add the rice and cook, stirring constantly, until the rice begins to absorb the butter and becomes opaque (don't let it brown). Add the saffron water and cover immediately. Reduce heat to low and cook 20 minutes, or until all of the liquid is absorbed. A couple months ago, when I was in Seattle for the holidays, I had the most fantastic cocktail at the art museum cafe... a whiskey sour made with Douglas Fir Syrup and a housemade brandied cherry. The Douglas Fir syrup is quite easy to make - it's just a basic simple syrup recipe, and you can actually use any kind of evergreen needles. I used Corkbark Fir needles gathered on a hike near Sandia Crest, and it turned out great. My guess is it's best to use just the very tips (the last inch or so), which are the newest needles. Combine all ingredients in a small saucepan, bring to a boil, and simmer about 5 minutes. Pour into jars and cool. Shake vigorously with ice. Pour into martini glasses. 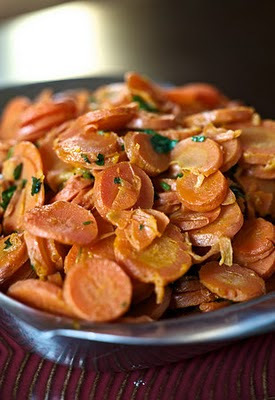 Carrots are another one of those long-keeping vegetables that lasted our ancestors through the winter. A cool season crop, carrots can be planted in a cold frame in September and are ready to eat in early spring. The cold weather actually makes carrots sweeter! And now is the time to start planting carrots again in your garden. Saffron crocus is rumored to grow well in New Mexico, because of our dry climate and late summer rains. The bulbs I planted last fall in a container on my porch have had leaves all winter (they even survived the -10°F cold snap) and hopefully I'll be harvesting the flower stigmas this fall. Here's the best link I've found explaining how to grow it: http://growingtaste.com/herbs/saffron.shtml. If you're not ready to try growing your own... although it's expensive, a little goes a long way, and word on the internet is that www.saffron.com has the best prices on high quality saffron. This charming side dish is a great way of dressing up carrots, and it goes just as well with lamb chops as with fish or chicken. Soak saffron in boiling water to bring out its flavor. In a large skillet fitted with a lid, melt the butter over medium heat. Add the carrots, garlic and orange zest. Toss to coat with butter, and season with salt and pepper. Add the saffron water, cover and simmer until the carrots are tender, about 5 minutes. Add Grand Marnier and parsley, toss and cook a few minutes longer, until most of the liquid is evaporated. Serves 4. The gorgeous weather these last couple weeks has been tricking me into thinking spring is just around the corner, even though we still have all of March and April to get through... but let's enjoy it while we can! 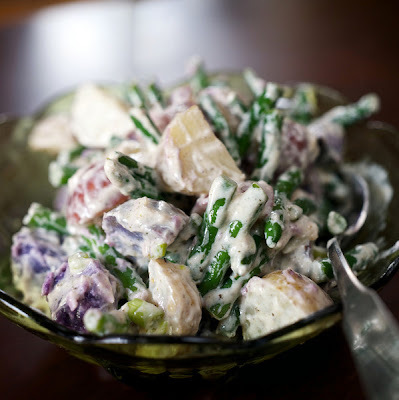 Everyone in the neighborhood was grilling last weekend, and this is the perfect side dish for an early-spring cookout. Just this week, I dug up the last of the potatoes we grew in the garden last summer. Potatoes are the essential winter food – they keep all the way through until spring in a dark cabinet, or in the ground if well-mulched. And if you grew green beans last summer, chances are you still have a few in the freezer. Made with horseradish, this salad is a nice break from the usual mayo-and-mustard versions. It's especially beautiful if you use a few purple potatoes. It can be served warm or cold, and it's great even without the green beans. Herbes de Provence is a delightful blend of thyme, tarragon, sage, marjoram, parsley, basil, savory, chervil and lavender blossoms. If you don't want to buy it specially for this recipe, just use as many of the above as you have handy - you could even make your own this summer. The recipe is adapted from one on www.thewednesdaychef.com, which was adapted from Yotam Ottolenghi's recent cookbook. Simmer the potatoes in salted water for 20 minutes, until tender. Toss the green beans in with them for just the last minute or so. In a large bowl, mix the the remaining ingredients. Gently fold the hot potatoes and green beans into the dressing. Serves 4 to 6. Look at these gorgeous photos! Can I just say once again how lucky I am to be working with Sergio Salvador? Here's a special Valentine's day recipe that I'm really excited about - it's so delicious, your beloved will swoon. I love oysters, but they're not exactly native to New Mexico, and this is a veggie blog. 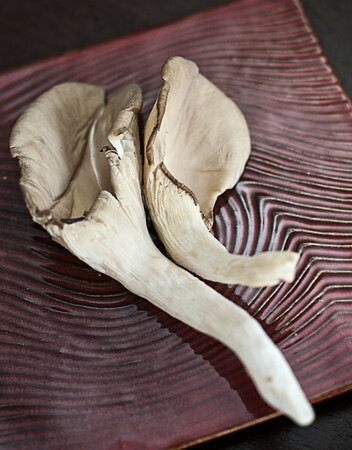 Mushrooms have long been considered an aphrodisiac, as have oysters, and we are lucky enough to have access to great locally grown oyster mushrooms here in ABQ. They're available year-round in Albuquerque from Exotic Edibles or Los Poblanos Organics. Even without actual oysters, this dish is “rich enough for Rockefeller” just like the original. Oysters Rockefeller was created at Antoine's restaurant in New Orleans over 100 years ago, and has been a closely guarded secret ever since. This recipe is adapted from one on The Gumbo Pages, a great website devoted to New Orleans culture. Purported to be a close reproduction of the original, it uses fresh herbs, green onions and no spinach. Chervil is difficult to find in stores (but easy to grow), so just use a little extra tarragon if you don't have it. Fresh herbs are the key to great flavor, but as long as you use fresh celery leaves and parsley, you can get away with dried tarragon. Mince the green onion, parsley, tarragon, chervil and celery leaves, as finely as possible (you can do this in a food processor). Mix with the bread crumbs and butter to make a fairly smooth paste. Season with salt, pepper, Tabasco and Herbsaint or Pernod, as desired. Preheat your oven's broiler. Trim the stem off each mushroom (you can mince these up and mix them into the filling). In a wide skillet, heat the olive oil on medium flame. Lightly salt the gill side of each mushroom and saute them gill side down until nicely browned, 5 to 10 minutes. Remove from skillet and spread the filling onto the top side of each mushroom. Place the mushrooms on a baking sheet and broil until the filling is bubbling and browned, 5 to 10 minutes, watching carefully to make sure they don't burn. Serves 2. Fresh, delicately-flavored oyster mushrooms are a tasty treat available year-round from local producers. Gael and Scott of Exotic Edibles, based in Edgewood, have been selling their mushrooms at the farmers' markets in downtown Albuquerque and Los Ranchos for about ten years now. Los Poblanos Organics has also started producing oyster mushrooms in the last couple years, available through their CSA. Whenever I'm trying to think of the perfect thing to do with oyster mushrooms, I'm disappointed in the recipes I find online. 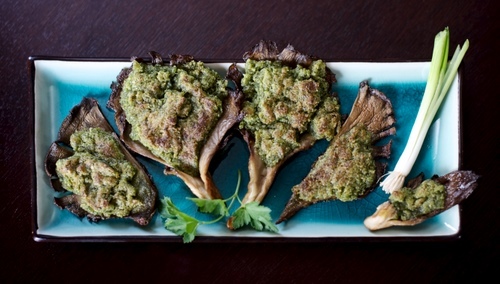 Either they treat them like any other mushroom, and the other ingredients cover up their delicate flavor, or they simply grill them. So I thought I'd start here, simply roasting them along with some heirloom garlic, and some heirloom pumpkin (the Black Futsu) - both from the farmers' market this summer and bred for keeping well through the winter. Watch for more oyster mushroom recipes to come. We've also been enjoying delicious local chicken this year from Keller's Farm Store and Pollo Real. Keller's raises their poultry near Moriarty. Pollo Real raises certified organic pastured chickens near Socorro, and sells them at La Montanita Co-Op and Santa Fe Farmers' Market. They also have a CSA, and now is the time to sign up – memberships start in February! Preheat oven to 400°F. Rinse the chicken, pat it dry, and sprinkle salt all over the skin. Set it breast-side up on a rack, either the folding kind set in a 9x13-inch baking pan, or the flat kind set over the pan so there is room underneath. Trim roots off the head of garlic, and slice the top off to expose the cloves. Drizzle about 1 tablespoon olive oil over the top. Set cut side down in the pan under the rack. Roast 30 minutes. Toss the squash, shallots and mushrooms with wine, herbs, pepper, 2 tablespoons olive oil, and a pinch of salt. Add the vegetables to the baking dish and turn the garlic heads cut side up. Don't be tempted to pile in more squash, as I tend to do, because it may throw off the cooking time. Roast for 30 to 45 minutes more, until the vegetables are tender and the chicken is done (be sure to check the bottom side). Allow the chicken to rest for 5 to 10 minutes. 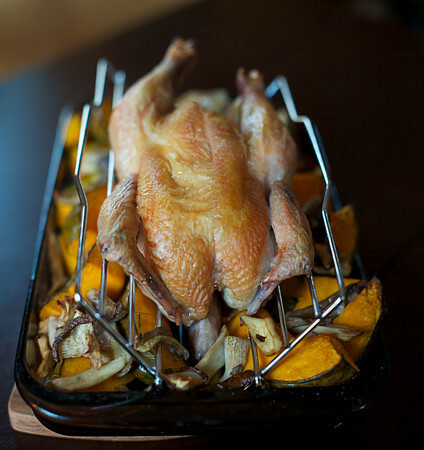 Transfer the chicken and vegetables from the baking dish to a platter. Deglaze the baking pan with ½ cup of white wine and simmer in a small skillet or saucepan. Cut the chicken into quarters, and serve with vegetables and wine sauce. Serves 4. I'm thoroughly enjoying the snow days this week, cozy inside, cooking up all kinds of things. I've been craving some preserved lemons, and I haven't made them in a while. They're a wonderful addition to Moroccan food, such as a chicken tagine with green olives and preserved lemons, or lamb and lentil salad with preserved lemons. Scrub each lemon well, and cut a thin slice off each end. Make two lengthwise cuts almost all the way through the lemon, so that the quarters are still connected at one end. Pack each lemon with about 1 tablespoon salt. Pack the lemons tightly into a quart mason jar, along with the spices, pressing them to squeeze the juice out. If necessary, add more lemon juice to cover. Screw on the lid, and leave at room temperature for about 3 weeks - don't worry, they won't go bad, the acidity and salt prevent any bad stuff from growing (kind of like in pickling). Then you can store them in the refrigerator for 6 months or more. A super-simple recipe from Farmer Monte in the LPO newsletter. I got a Meyer lemon tree this year, which I'm growing in a container indoors, and it has little baby lemons on it right now! The flowers smell wonderful, and I have high hopes for the fruit, but unfortunately it has a nasty case of scale* that I need to deal with soon. Juice the lemons, discarding the seeds. Slice the lemon rinds very thinly, or chop very finely. The finer you chop them, the shorter the cooking time. Place the juice, rind, and water in a small saucepan and boil until the rinds are tender, about 20 minutes. Serious marmalade-makers would soak it overnight, but I didn't. Add sugar, then simmer another 30 minutes or until the rinds are soft, it is quite syrupy, and begins to turn a nice amber color. Note: On the first batch, I thought I would leave out the water and I just cooked the rinds, juice and sugar in the pot all at once. This was a mistake, because then it took about 3 hours for the rinds to soften. It needs a period of cooking in water without the sugar, because the sugar actually draws moisture out of the rinds, keeping them hard. *Scale is a strange insect, kind of like an aphid or fruit fly in the juvenile stage (they fly around) but as an adult it attaches permanently to the stem of a plant and develops a protective shell over itself. This makes it difficult to kill! And they breed like crazy indoors. The only thing to do is to scrape the adults off with your fingernail or a toothbrush. I scrubbed the entire tree (it's pretty small) with a toothbrush, and a few drops of Dr. Bronner's peppermint soap in about a cup of water. Next I will spray it with neem oil (an organic insecticide derived from the neem tree in India) to kill any juveniles that might have been out and about, thus missing the blitz. It kills on contact, so hopefully this should do it!